Last week I did a post on a hundred-year-old recipe for Mint Syrup. 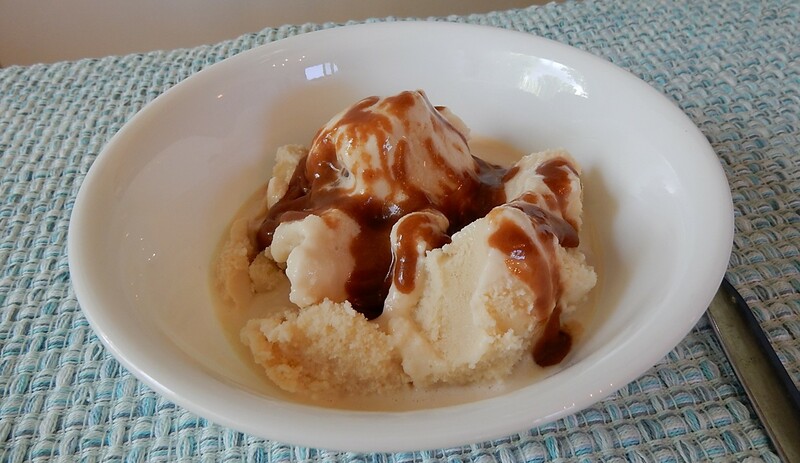 In that post, I said that the syrup could be used in coffee (it’s delicious) – but several readers suggested that it would be wonderful on ice cream, especially if it was mixed with chocolate syrup. Well, great minds think alike – and it goes across the years. 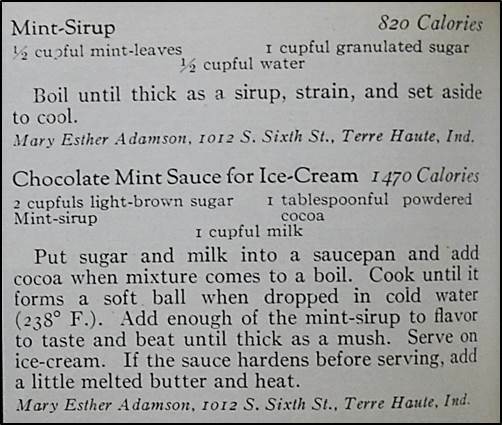 The magazine that contained the Mint Syrup recipe, also contained a recipe for Chocolate Mint Sauce for Ice Cream. This sauce was much thicker than most modern chocolate syrups, but it was delightful on vanilla ice cream. The hundred-year-old recipe calls for lots of brown sugar and only one tablespoon of cocoa. I expected the syrup not to be chocolaty enough – but I was wrong. It had just the right amount of chocolate with the brown sugar apparently contributing to the rich flavor. I found this recipe challenging. When I made it, the sauce quickly hardened into a candy-like consistency. I reheated it and added butter. I then removed from the heat and stirred rapidly until the sauce began to thicken – and it again got too thick, so I added water (quite a bit of it), and stirred until the consistency seemed right for a sauce. Here is the recipe updated for modern cooks – though I feel like it still needs a bit more tweaking. If you try this recipe, I hope you’ll add comments about how well it turned out – and whether you made additional revisions to the recipe. Put the brown sugar and cocoa in a sauce pan; stir to combine. Gradually add the milk while stirring. Bring to a boil using medium heat, then reduce heat and cook until it forms a soft ball when dropped into cold water (238° F.). Remove from heat, stir in the butter. After the butter has melted, add the mint syrup. Stir rapidly until the sauce begins to thicken; add water if the sauce is too thick. Serve on ice cream. Posted on July 30, 2017 July 28, 2017 by SherylPosted in FoodTagged chocolate, ice cream, mint, recipe. Oh yum. I have a mint sauce that was given to me, but it’s almost out. Now I can replace. If you make this sauce, you’ll have to let me how it compares with what you currently have. I thought “sirup” was a typo, but when it showed up a second time, I decided it wasn’t. I wonder if that was a standard spelling a hundred years ago? I see the different spellings across the same books for sirup, too! My thought is that it was a regional spelling. What did you think needed tweaking in the recipe? The flavor? Texture? My mother makes a mocha mix and it uses a similar kind of incorporation. She adds just the tiniest amount of salt at the end and it seems to really pull it together. I really struggled to get the consistency right. Once the sauce cooled was is quite firm. When I first made the Chocolate Mint Sauce, some of the sugar crytalized. After I reheated it, and added butter and water, the texture seemed better but the consistency still didn’t seem exactly right. I’m guessing that modern chocolate syrups contain corn syrup which results in a better consistency. I have a rabbit who behaves the same way….and two kids on occasion, come to think of it! Sounds wise to wait until some of the children come to visit. It’s so easy to eat too many snacks and desserts. Feels kind of like a miracle. Sounds like a wonderful fun treat. Yummy! I am enjoying all your MINT recipes! We usually have several varieties growing, and I love mint anything….thanks. I often make syrups with the wrong consistency. I think there must be days when syrup just misbehaves.